President Barack Obama waves as he arrives on Air Force One at Abraham Lincoln Capital Airport, Wednesday, Feb. 10, 2016, in Springfield, Ill. Obama returns to his political birthplace with a plea to a joint session of the Illinois General Assembly for better politics. 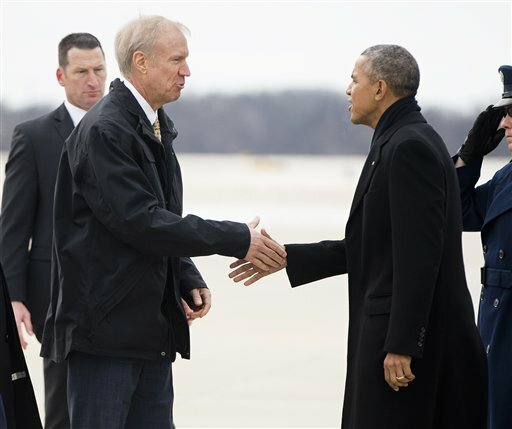 President Barack Obama is greeted by Illinois Gov. Bruce Rauner on the tarmac during his arrival on Air Force One at Abraham Lincoln Capitol Airport in Springfield, Ill., Wednesday, Feb. 10, 2016. Obama returned to Springfield, the place where his presidential career began, to mark the ninth anniversary of his entrance in the 2008 presidential race. He plans to deliver an address to the Illinois General Assembly at the Illinois State Capitol. President Barack Obama came here nine years ago to declare it was "time to turn the page" on cynical, special- interest politics. He returned Wednesday lamenting that the story hasn&apos;t changed. In a day trip to the state capital where he began his career and also launched his presidential bid, Obama fretted over the harsh tone and hardening partisanship he says is turning off voters. He waxed nostalgic about the chummier relations and bipartisan deal-making of his youth. He appealed to state lawmakers, and the public, to rid politics of "polarization and meanness" that discourage widespread participation in civic life. "It&apos;s gotten worse," he said bluntly in an address to the Illinois General Assembly, on the anniversary of his entry into presidential politics. "Today, that kind of citizenship is threatened by a poisonous political climate that pushes people away from participating in our public life," Obama added. "It turns folks off. It discourages them. It makes them cynical. And when that happens, more powerful and extreme voices fill the void." The sentiment echoed Obama&apos;s 2007 address delivered in the cold on the steps of the Old State Capitol building. It is one Obama has repeated throughout his presidency amid miserable relationships with congressional opposition and new levels of gridlock in Washington. Still, it carried added resonance on Wednesday, as outsider candidates in both parties celebrated huge victories in the New Hampshire primary. In the presidential campaign to succeed him, both parties are dealing with voters deeply frustrated with the political climate. Republicans have seen a willingness to embrace coarsening conservation — Donald Trump has made a habit of using personal insults barely suitable for print. On the Democratic side, Bernie Sanders is calling for political revolution fueled by animosity toward corporate interests. Obama has not formally waded into the Democratic race, but is increasingly trying to play the role of a Greek chorus. On Wednesday, he spent much of his time outlining his worries about the role of big money in politics and the impact on legislating. He warned that compromise is necessary, and "doesn&apos;t make me a sellout to my own party." He offered a few broad prescriptions for changing the political climate, including the way congressional districts are drawn and making it easier for people to vote in elections. He noted with some amusement that his audience, the state lawmakers he held up as model for bipartisan pragmatism, seemed to have knee-jerk partisan responses to his suggestions. "This is fascinating to watch," he said. Obama&apos;s trip was laden with nostalgia for the capital where he got his start as a state senator. Before delivering his remarks, he dropped by one of his old lunchtime haunts to greet diners and pick up an order to go. He spoke fondly of getting to know his colleagues in Springfield over fish fries and poker games, an aspect of political life in Washington that has all but disappeared as House and Senate lawmakers rush out of town on weekends to spend time with family back home. "I miss you guys," he said as he left the cheering chamber. Obama called "my inability to reduce the polarization and meanness in our politics" one of his few regrets as president, although he didn&apos;t acknowledge any specific mistakes. As culprits for the climate, he pointed to the media, short-sighted political tactics, gerrymandered districts and the Supreme Court&apos;s Citizens United decision that opened up the floodgates for undisclosed, unlimited contributions. From Springfield, he was headed to California where he will raise money for Democrats, appear on "The Ellen DeGeneres Show" and host the leaders of 10 Southeast Asian nations for a two-day summit beginning Monday. Obama returned to a statehouse that has weathered its share of turmoil since he left it behind in 2004. Two Illinois governors have been convicted of corruption and sent to prison — including Democratic Gov. Rod Blagojevich, who is serving time for trying to sell the U.S. Senate seat Obama vacated when he became president. Meanwhile, Democrats who control both chambers of the legislature have butted heads with Illinois Gov. Bruce Rauner since the Republican and former businessman took office last year. The two sides have yet to agree on a state budget more than eight months into the fiscal year, prompting massive cuts to higher education and social service programs. Obama returned to Springfield with several of the architects of his successful first presidential campaign, including then-chief strategist David Axelrod and Valerie Jarrett, who remains a senior White House adviser. Both accompanied the president aboard Air Force One. Associated Press writers Josh Lederman in Washington and Sara Burnett in Chicago contributed to this report.